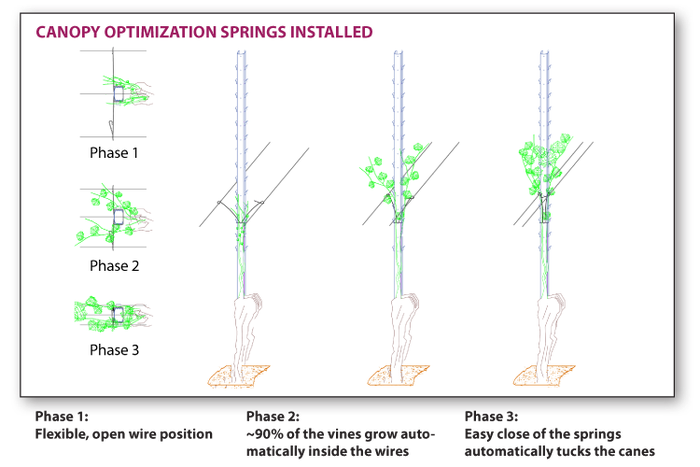 Instead of the traditional fixed wiring system, the springs, having replaced the rigid cross arms, can be left open during the growth period and by a simple closure of the springs at the right time, tucking is achieved automatically. Using a combination of different size springs, the shape of the canopy can also be customized. The springs can be closed/open at any time at any location, hence further optimizing access, aeration, sunburn protection for specific parts of the canopy. The springs also provide for easy installation and removal of bird netting as an added benefit and increased yields.